Aperture in normal English language means opening or hole. And in photography, that's exactly what it is. The lens has a diaphragm inside that is normally wide open, but closes down to the size you choose as you press the shutter button. Let's try an experiment. On your camera, set it to M (manual) mode. ISO is not relevant at the moment. Set the Aperture to the biggest number you can - anything bigger than f18 is ok. Set the shutter speed to more than 3 seconds. (Probably shown as 3.2" on the viewfinder readout, not 0"3.) Now turn the camera around - SELFIE! - so you can see down the lens, and take a picture. On some smaller lenses, it may be hard to see the aperture diaphragm closing down, so here's one I prepared earlier. At f/1.4 you can't see the diaphragm at all, but you can see it clearly from f/4 onwards. Technically speaking the Aperture is the ratio of the lens's focal length to the diameter of the entrance pupil. Roughly speaking, the ratio of how long the lens is compared to how wide the opening at the front it. The numbers used for Aperture may be a bit confusing. Firstly, they are usually prefixed with "f" and sometimes written "f/". Let's not worry too much about why "f" now, but appreciate that it helps to differentiate from other numbers we may see. 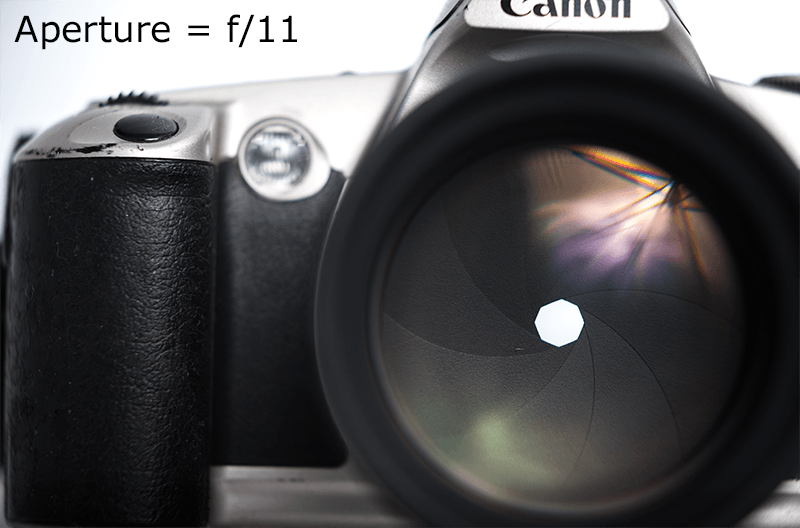 Typical Aperture numbers are f/2, f/2.8, f/4, f/5.6, f/8, f/11, f/16, f/22. Some lenses can go bigger or smaller. Because the numbers are a ratio, small numbers mean big, and big numbers mean small. Now, because we know these facts we don't have to be confused any more. Let's practice. I'll ask you to give me a small Aperture, and you'll reply with f/16. 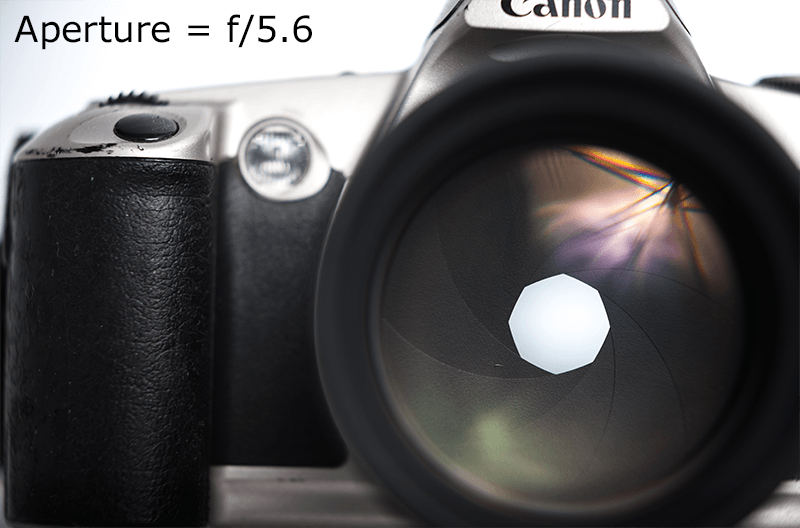 The bigger the aperture, the smaller the number, the more light is allowed in, and the more expensive the lens. The first three are absolute physics, while the latter is just a guide. 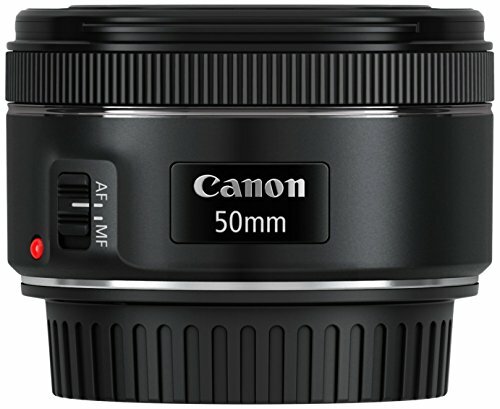 For example, Canon's "nifty-fifty" 50mm f1.8 lens costs less than £100. We use Aperture to be creative. At small f-numbers, your focus will be shallow, and at bigger f-numbers almost everything will be in focus. At this point I could draw you diagrams of how light moves through a lens and discuss the physics of why this is relevant, but lets keep doing more practical stuff. This knowledge of big and small apertures has given you the ability to set your Aperture so that you can decide how much of the scene is in focus. Or to put it another way, to be able to control how much of the scene is out of focus so that you can isolate your subject. You will take two photos of the same subject at different Apertures. With your camera in P mode, set your ISO to 1600. Place your subject (fluffy toy??) about 2 metres from the background, and about 1 metre in front of you. If you have a zoom lens, zoom to more-or-less 50mm. Roll the wheel on your camera so the Aperture goes to f/16. Don't worry about Speed, but make a mental note of it. Take the picture. Roll the wheel the other way so the Aperture goes to the smallest number your lens can manage. Again, mental note of Speed. Try keep the same framing of your subject. Compare the two photos. Which do you prefer? What did you notice about the Shutter Speeds on each photo?